ACD mPower Tools extends the digital imaging features of MicrosoftÂ® WindowsÂ®. Save hours with at-a-glance metadata and thumbnail views in Windows of Canon Raw, PSD, Kodak Photo CD, AOL ART and over 40 more formats not normally supported. Find and drag files into PhotoshopÂ® fast. Get previews and batch editing with a right-click. View more picture and graphic formats. See and sort on additional metadata details. Preview video, audio and images. Plus, batch edit, print, and share with a right click. Find and grab media for other programs fast. 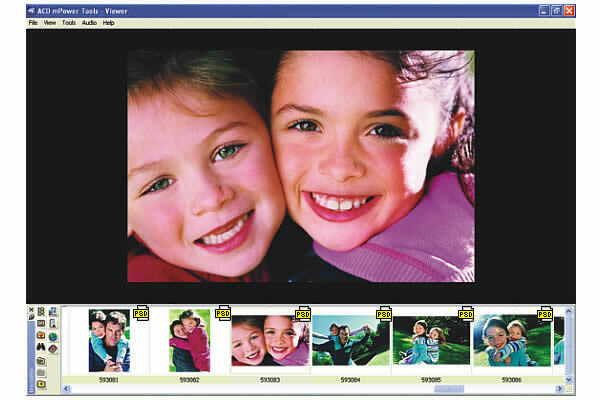 Photoshop users will love the media bar for quickly finding pictures and dragging them into Photoshop or other programs. Photographers will speed their workflow - viewing and sorting by camera metadata in Windows and seeing thumbnails for 50 professional formats including over 40 not normally supported in the operating system such as Canon Raw, PSD and Kodak Picture CD. Windows users will find it a snap to work with images, sound and movie clips. With the handy right-click menu, just click for quick previews of video, photos and sound, for a fast graphics converter and to edit batches of images and share them. ACDSee users will love the right-click access to their favorite ACDSee features and plug-ins in ACD mPower Tools. Plus, ACD mPower Tools can share the ACDSee 5.0 image database for an integrated working environment. ACD mPower Tools photo imaging software lets you think less about what program to use and more about your images, video and audio. This site does not contain serial number, crack, keygen ACD mPower Tools serial number : serial number is the simplest type of crack. A serial number(cdkey,product key,etc) is register the program as you may already know. a crack or keygen may contain harmful software. If you cannot find the exact version you want, just give it a try. for more information read .nfo/.txt/.diz file include in zipped file.